Letris 2 by Aram Julhakyan is a fun and very addictive word puzzle game for the iPhone which is also available on the iPod Touch and iPad. Basically, the object of the Letris 2 app is to form words from random letters and clear the screen in the time allowed. You can download the application for free, but there is a nominal charge if you want to advance to the highest levels. The controls are easy to use, and I had no trouble navigating my way around. You simply touch each letter to make a word and hit the green bar when the word is complete. If you use the wrong letters by mistake, the bar will stay red, and you just tap the bar to clear the incorrect word. You can choose from normal, hard and extreme modes. Personally I did not feel there was much of a difference between the normal and hard modes, but in extreme mode, you can only select neighboring letters to make a word. Also, you can choose to play “Letris 2,” “ Acronymus” or “Word Matrix.” In each of these games, you have to pass a level in order to advance to the next one. After passing the fifth level, you have to pay to continue. 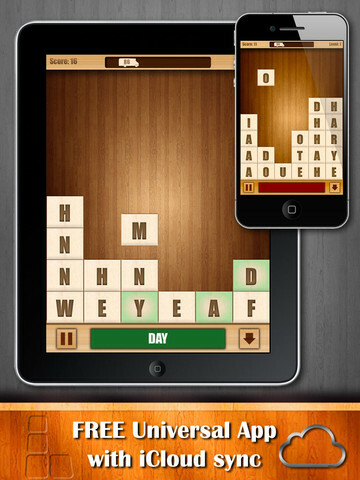 In Letris 2, lettered-tiles slide down the screen, and you have to tap a tile to begin forming words. The letters will show up in the green bar and form words. When you form a word, you have to hit the green bar after each word to remove it from the screen and get credit for the word. The object is to make as many words before the screen fills up with tiles. You also get bonus points for finding words fast enough to completely clear the screen. When the time is up, a chalk board appears with the words that you made. You can touch one of the words on this chalk board to get definitions and information about the word. In “Acronymus”, the object is to unscramble the letters on the screen to make words. You can choose to ask for hints or press the white flag to give up. When you ask for hints, the next word is highlighted for you. Personally, I didn’t like having the entire word given to me. I would have it enjoyed it more if I had to figure out the rest of the word. In “Word Matrix”, the screen is filled with letters and you have to find words. I enjoyed the extreme mode best of all because it was the most challenging. I really enjoyed using this iPhone app. I felt that it was easy, convenient and a good value. 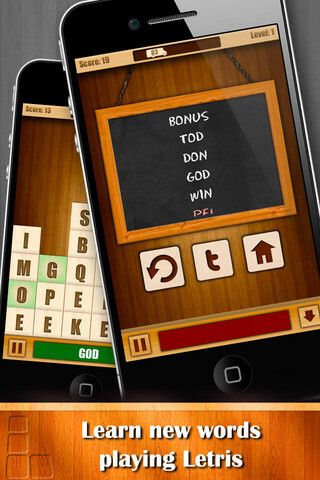 AppSafari review of Letris 2: Word puzzle game was written by Joe Seifi on December 10th, 2011 and categorized under App Store, Featured, Free, Fun, Games, iPad apps, Universal, Word Games. Page viewed 4627 times, 1 so far today. Need help on using these apps? Please read the Help Page.